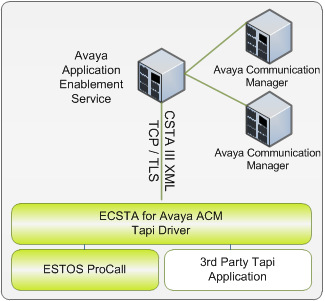 estos ECSTA for Avaya ACM offers a Telephony Service Provider (TSP) for Microsoft® Tapi 2.1 (also 2.2 and 3.0). This Tapi driver implements a central communication between a PC and the PBX system. estos ECSTA for Avaya ACM uses the Avaya Application Enablement Server (AE Service) for connecting to the PBX system.